Allow me to introduce you to this recipe. We go way back. I first stumbled upon it when browsing The Spice House’s website (which is owned by Bill Penzey’s sister. They’re just a whole family chock full of spice tycoons, I tell ya). At the time, St. Patrick’s Day was right around the corner. I’m not a huge fan of corned beef, unless it’s in hash form. The recipe called for Guinness to be used, so I though it would be a festive alternative to the traditional corned beef and cabbage. I was right, it was a huge hit. I went out with some girlfriends that evening, and when I returned…it had all been consumed by the husband. And make no mistakes folks, it was a large roast. Needless to say, it since became my standard pot roast recipe. 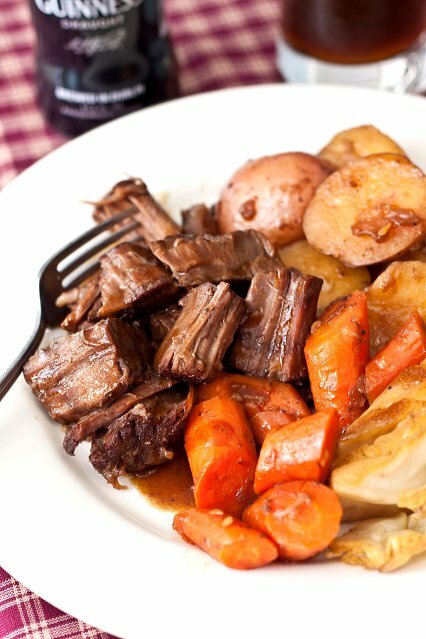 So much more flavor that your standard Crock-Pot variety pot roast. Not only that, but I feel like it’s been improved upon by trying out different beers. I had heard wonderful things about coffee-braised pot roasts. So, I thought it would be very interesting to combine the two. Again, boy was I right! We have 2 oh-so-wonderful local breweries in my area (hey – we don’t have much, but we’ve got good beer by God!). Both happen to make wonderful, rich dark stouts that use coffee in the brewing process. The first is Dogfish Head’s Chicory Stout. If you haven’t heard about DogFish, and like beer, do yourself a favor and try something out. You can find them nationwide, if you look hard enough. The second is Evolution Brewing Company’s Rise Up Stout. “Evo” started up about a year or so ago, right here on the Eastern Shore, and have been putting out wonderful craft beers. Chances are if you don’t live in the Chesapeake area, you won’t find them. But, by all means, get out there and explore the beer coolers at your local stores. Lots of great microbreweries are springing up all over the place. I’m sure you could find something near you that is equally as wonderful! I don’t list potatoes in the recipe, but feel free to add them in with the rest of the other veggies. I usually use red potatoes that I’ve halved. However, it’s wonderful with mashed potatoes too. You want as much of the gravy as you can get, folks. Enjoy this recipe, I promise you that you won’t miss that corned beef a bit! Heat oven to 450 degrees. Season beef generously with salt and pepper. Heat oil in large dutch oven over medium-high heat for 2 minutes. Place roast in pan, and sear well on both sides until nice and brown. Remove roast to plate and set aside. Add onions to the dutch oven and cook, stirring often, until the onions are starting to brown on the outsides. About 4 minutes. Add garlic and cook for an additional minute. Add the beef stock to the pan, then slide the beef into the stock. Cover, and cook for 1 hour. Pizza made at home used to scare me. Aside from a grill, it’s hard to get a hot enough temperature in your oven to get a decent, crispy crust. After a few attempts, I lost all hope and gave up. A few months later I saw an episode of The Cooking Loft with Alex Guarnaschelli. She was executing a technique for pizza that I had never thought of. Frying the dough in a cast iron skillet before topping it. Then, finishing off the baking in an oven. Genius! This pizza is great. So great in fact, we rarely order it out anymore (not that we have a slew of great pizza shops around here anyway). This recipe makes 2 12-inch pizzas.Top it with whatever you like. Unlike many pizza crusts, this one can take a beating. So, pile the toppings on. She can handle it, I promise! 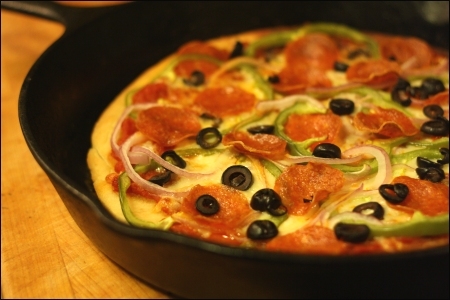 In a 12 inch round cast iron skillet, heat about 2 tablespoons of the olive oil over medium-high heat. Use a spatula to press gently on the top of the round to keep it relatively flat as it cooks. When you see it is slightly brown on the underside, season the top lightly with salt and flip. Remove from heat. Season the other side with salt. Spread about 3/4 cup sauce evenly over the dough. Sprinkle with half of the mozzarella. Then, top with whatever toppings you like. Place in pre-heated oven for about 10 minutes or so, until cheese is nice and melty. Repeat with remaining dough and topping. Using a sieve or strainer, “sift” about half of the flour over the yeast mixture and blend until smooth with your hands. Add the salt, pepper and honey and mix to blend. Sift in the remaining flour and mix to blend. Press gently on the dough and turn it onto a floured surface. Divide the dough into 2 equal parts, rolling each half into a loose ball. Cover with a clean kitchen towel and allow the dough to rest for an additional 15 minutes. Flatten each ball, and roll into a 12 inch round. Place each round in a single layer on a lightly greased baking sheet.